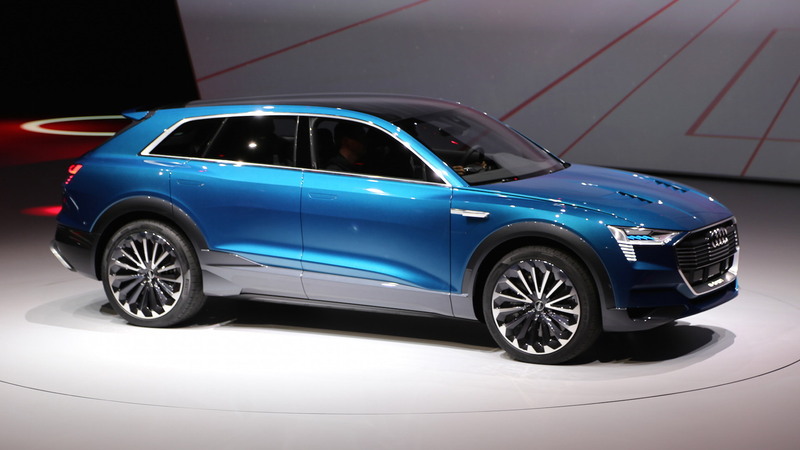 Audi is working on an electric crossover SUV designed to challenge Tesla Motors’ [NSDQ:TSLA] Model X. 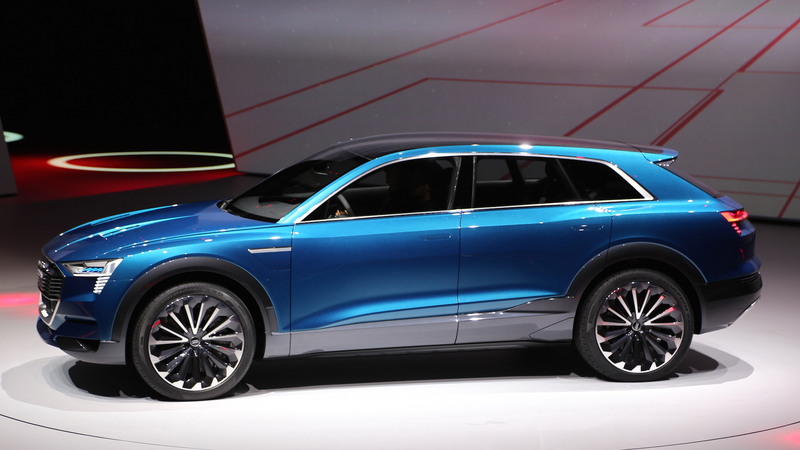 The vehicle, expected to be badged a Q6, won’t arrive until early 2018, but at this week’s Frankfurt Auto Show we are being treated with an early look in the form of the e-tron quattro concept car. The concept, like the production version it will spawn, rides on Audi’s latest MLB Evo platform and was designed from the ground up as an electric car, with its shape designed in such a way as to reduce drag while also highlighting the technical aspects with its clean surfaces and edgy look. The concept also features an aerodynamically optimized underbody that’s completely closed, helping to achieve a low coefficient of drag of 0.25—a record for the SUV segment. Its electric drivetrain was developed using knowledge gained from the R8 e-tron electric supercar’s gestation. Three electric motors—one on the front axle and two on the rear—deliver total system output of 496 horsepower and 590 pound-feet of torque, as well as all-wheel drive with intelligent management to direct torque where it is needed. A 95-kilowatt-hour lithium-ion battery from Korean firms LG Chem and Samsung SDI is positioned between the axles and below the passenger compartment, helping to lower the center of gravity and provide better balance. Performance estimates include 0-62 mph acceleration in 4.6 seconds and a governed top speed of 130 mph. 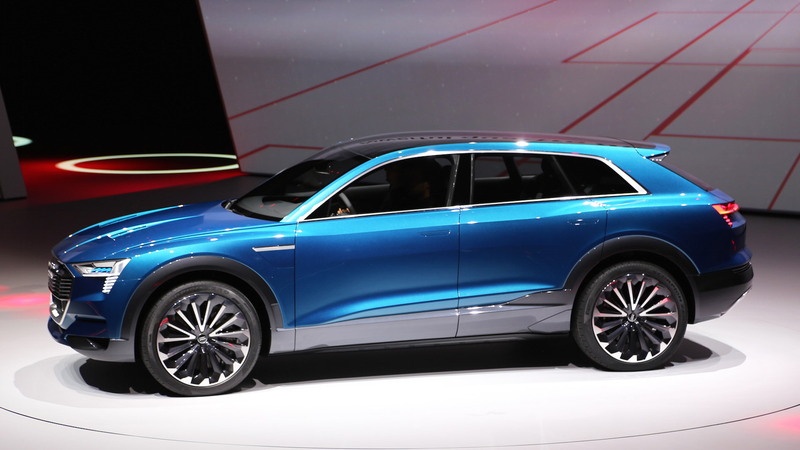 With moderate driving, Audi promises a range of at least 310 miles on a single charge. This range is almost certainly based on the European testing cycle, though, which produces longer range ratings than our own EPA tests. A reasonable rating for the United States might be 240 miles or so. Charging can be done using AC or DC power outlets, with the latter allowing a full charge in as little as 50 minutes using a 150-kilowatt high-speed charger. There is also the option of wireless charging. For this, the concept uses an autonomous parking feature that guides it to the proper position for a floor-mounted charging plate. A roof-mounted solar panel is also featured to help add charge on those sunny days. Inside, there are four individual seats. We can see that designers have added a high-tech interface with numerous display screens. There are screens for the main instrument cluster, central infotainment system, and separate HVAC controls for front- and rear-seat passengers. 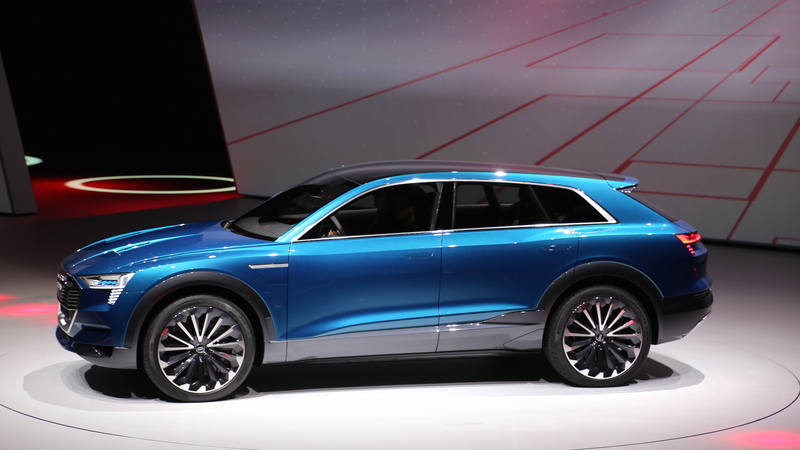 Audi has already confirmed with its series of forward-looking Prolouge concepts that such a design will feature in its next-generation models. In terms of size, the concept sits between the small Q5 and mid-size Q7, which makes sense considering the production version is expected to be badged a Q6. 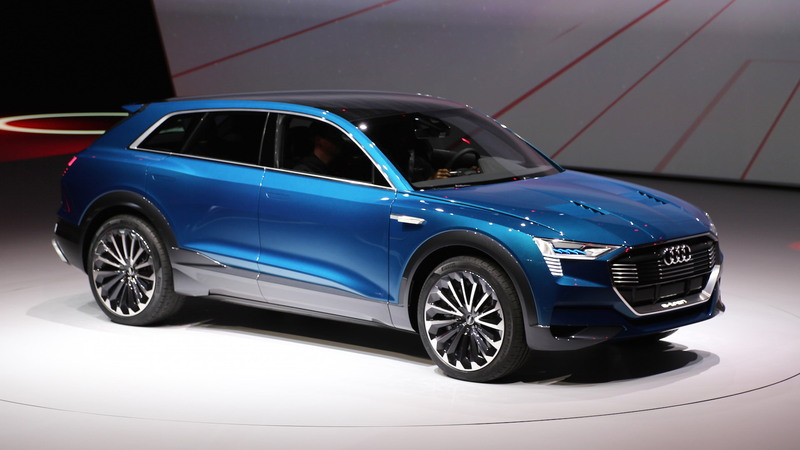 The production version is being heavily promoted as an electric crossover but Audi is investigating other powertrains including a likely plug-in hybrid setup as well as a less certain hydrogen fuel cell. For more from the Frankfurt Auto Show, head to our dedicated hub.